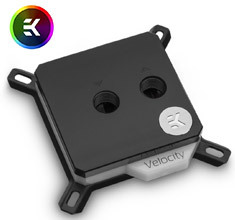 The EK-Velocity is the new high-performance flagship premium quality CPU water block for modern Intel processors. It features a fresh design that will enable a vast number of variations and options for enthusiasts and demanding users as well! 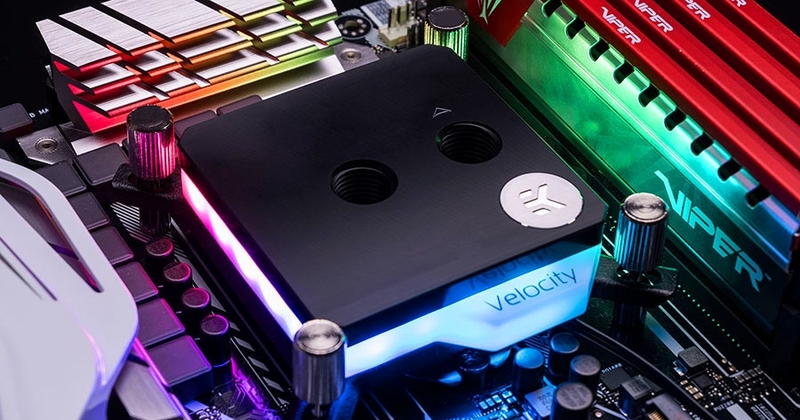 EK Velocity series CPU water blocks embed the 5th generation of the award-winning EK CPU water block cooling engine, further tweaked for performance and optimal coolant flow! Low hydraulic flow restriction enables this product to be used in setups using weaker water pumps or lower pump speeds for added silent operation, while still achieving top performance! The water block also comes with the most sophisticated RGB lightning implementation on the market to this day. A total of 24 LEDs are housed under the aesthetic shroud which connects to a standard 3-pin 5V D-RGB header. The purest copper available on the market is used for the EK-Velocity cold plate which is precisely machined to a dense micro-fin structure. The contact surface itself is machine polished for a better contact with the CPU IHS. This version of the water block features a nickel-plated cold plate with a CNC machined black POM Acetal top piece.